If you are like many victims injured in an accident, you will wonder how much you can recover for your losses. For Pennsylvania personal injury attorneys, providing an exact number is impossible. Even offering a ballpark amount is far from easy. 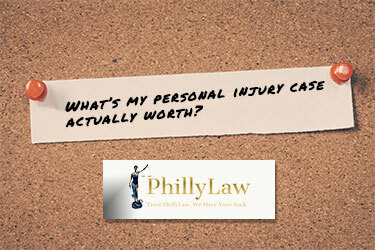 Instead, some answers to related inquiries may help you understand what is involved with determining the value of a Pennsylvania personal injury claim. The amount of money you may obtain in a personal injury accident is linked to your losses and how much it would take to compensate you for them. How can I recover compensation after an accident? For many types of personal injury accidents, you would likely file a claim with the responsible party’s insurance company. There are forms to fill out and you must provide supporting documents, including medical records showing your injuries. Often, an insurance company will deny your claim if you do not have sufficient evidence. Sometimes, a claims adjuster will offer a lower amount that does not fully compensate you for your losses. Under the circumstances, you may need to sue in court to get the amount you deserve. How much is my personal injury case worth if I go to court? If you are forced to file a lawsuit in Pennsylvania civil court to recover the compensation you deserve, many of the same factors are at play. You must convince a jury that the other driver was at fault in the accident and that you suffered losses as a result of your injuries. What types of damages are available under Pennsylvania law? Many other types of losses as allowed by law. Are there legal limitations on what I can recover? Your right to compensation may be affected by different laws and rules. For one, there is a two-year statute of limitations in Pennsylvania which starts to run the day of your accident. If you do not file a lawsuit before it expires, you are forever barred from enforcing your rights. However, the two-year statute of limitations does not apply to minors, namely, individuals under the age of 18, who have additional time to sue by law. In addition, Pennsylvania Insurance Department regulations require all motor vehicle drivers to carry insurance coverage, but the minimum amount is $15,000 per person. If the at-fault driver in a car accident has the mandatory minimum, you cannot recover more than this amount from his insurance company. It should be noted, however, that your own insurance policy or a relative residing in your household’s policy may provide additional “underinsured motorist coverage” which may be collected if the injuries so warrant. Finally, there is a law regarding comparative negligence that may affect what your case is worth. If your own conduct was a “factual cause” with respect to an accident, your amount of compensation may be reduced by the percentage of fault attributable to your negligent actions. While this information may not provide an answer to the question “How much is my case worth?” with a specific number, it should be useful to review the factors that may affect your compensation. For more information on your rights and legal remedies, please contact PhillyLaw at 215-515-2050 or submit an online form to get you set up a free consultation. Our Pennsylvania personal injury attorneys will be happy to review the facts of your case and explain what damages you may be entitled to receive in your specific type of case.